What’s on your ux bookshelf? I’m a bookworm. My boyfriend has even nicknamed me ‘The Bookinator’. 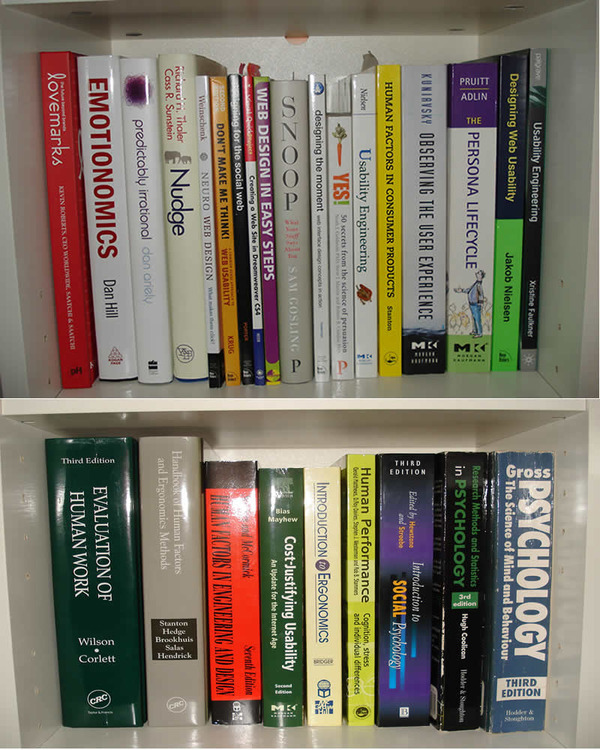 So it figures that I have a fair few usability, ux, psychology and design books on my bookshelf. In the photo below are just some of my ux books (they don’t all fit on my bookcase!). Excellent introduction to usability explained simply with clear and fun diagrams. Short book that you can read in a couple of hours. Very clever techniques for web design. Uses lots of persuasion principles and social proofing elements. I have about 20 post-it notes stuck in this one! This book is beautiful. Large inspiring pictures, brilliant graphic design work, key points easy to identify… The only downside is the book’s message seems to be duplicated quite a lot within the content. It’s still a joy to dip into and has good examples to demonstrate the points it makes. Warning! This book will bore the pants off you. It’s written in the most long winded technical manner that aims to bore even the most devoted ux professional. This book is like an old friend. It’s been with me since university and has all the damage to prove it, including lots of crinkley pages where my old uni windowsill leaked all over it. This book saw me through my coursework and exams and I just find the content fascinating. Timeless. So that’s what’s on my ux bookshelf. Now it’s your turn. Absolutely Recommend anyone starting to think about Interaction Design and User Experience Reads Don Norman’s The Design of Everyday Things (Formally known as The Psychology of Everyday Things). As Melissa says you will never look at a door the same way again and it explains the fundamentals of the Cognitive psychology of interacting with the world in a really good way. ‘Designing Interactions’ By Bill Moggridge is a fantastic Book + DVD with Case studies and interviews of Fantastic Interaction and Industrial design: Its Essentially a Practical history of our Discipline. ‘Sketching User Experience’ By Bill Buxton Describes a great methodology for being creative and producing great design, along with advice on how to show design early on without people thinking its finished because its visually appealing, or too basic because its just wireframes or sketches. altho this is 20 or so years old, many of the principles still apply and dont make me think actually stole errrm brrowed a lot of concepts from it. show iphone gesture based interfaces that steve jobs admits he nicked from this book.